Are you looking for the latest Sun Cellular promos? 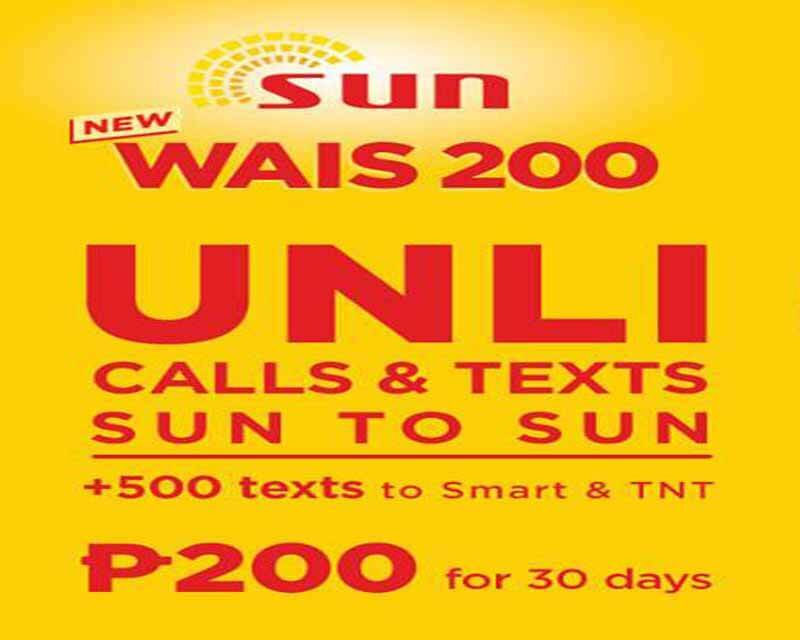 With the new WAIS 200 load, you can enjoy unlimited call and text to Sun network for 30 days. You can also enjoy added 500 texts to Smart and TNT subscribers plus you can choose extra options with 48 hours of registration for only 50 pesos. Extra add-on includes unli tri-net call, text to all networks, 1GB internet data and 25 minutes IDD call with 30 days’ validity. 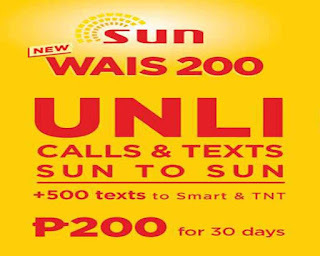 Be wise in choosing the right unli promo by subscribing to Sun prepaid WAIS 200. This is also hassle free as it only needs a one-time registration good for 1 month. Note: You can register to WAIS200 via text or load conversion method. Just reload your Sun Cellular prepaid account with 200 pesos, text the following keyword or code in the correct format to subscribe. Check out more details below for your reference. You can also check out WAIS100 unli call and text for only 100 pesos with 15 days validity. Compare this offer to Globe GoUNLI350 - also offer 30 days unli call and all net texts for only 350 pesos. If you want to avail additional or extra add-on worth 50 pesos, you can select or use the following keyword below to register within 48 hours of WAIS promo subscription. Just select add-on that fits with your needs and lifestyle. I have registered to WAIS200, but I cannot make a call using the 11-digit cellphone number. There is no free fb in sun wais 200?